Today’s diary is about a load of rubbish. It’s also about honouring the passing of old friends. One of the things that makes life so expensive in the UK is council tax. And a large part of that goes to pay for the weekly rubbish collection service. 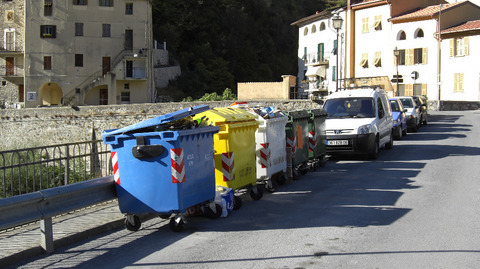 Every week, fleets of trucks set out all across the country to personally empty the bins of every household. In these days of enlightened recycling it’s not just one bin but several; brown for garden waste, green for cardboard, black for general rubbish – all carefully colour-coded though bafflingly different from one council to the next. The point has now been reached where there’s a world shortage of wheelie-bins, the factories unable to keep up with demand. It’s a bit different here. In France, Italy and other countries there’s no collection from your house. Instead, you take your rubbish to the “poubelle”, that gloriously suggestive French word for the big communal rubbish bins you see by roadsides or in special bays everywhere in and out of town. Here as in England these are colour coded. In Italy there are at least eight colours; blue for glass, white for cardboard, yellow for plastic, red for batteries and so on, with green for anything that can’t otherwise be classified. 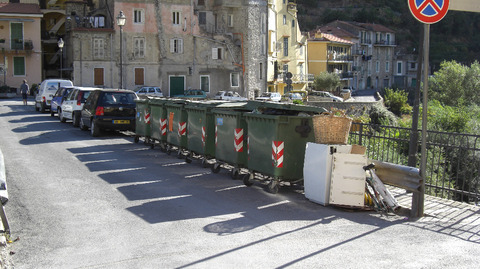 Rather than pay for teams of workers to empty small bins you take your own rubbish to the nearest poubelle and once a week or so the council turns up in a big truck and carts everything off to the recycling centre. In the England of days gone by, when the recycling centre was still called the “council tip”, you could browse among the piles of worn-out clothing, rusty washing machines and grass cuttings – at some danger to yourself – and look for priceless heirlooms cast off by mistake. (Am I revealing something about myself here?) Today this “totting” privilege is jealously guarded by the council workers themselves, who often turn a tidy profit on the articles people foolishly throw away. So on to the old friends. 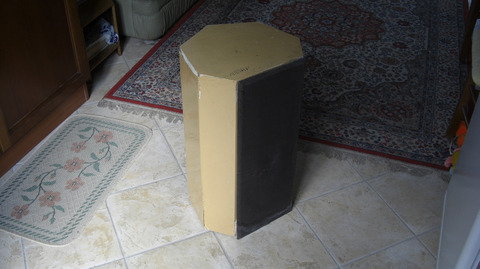 In about 1970 I built a pair of loudspeakers, designing an unusually-shaped seven-sided cabinet to house what was at the time a premium driver set from the Kef Concerto model. These items served me well for the following three decades but every dog has his day and by the time we moved here they were past their best. 1970’s chipboard was never made to last that long and the panels were gradually turning to powder, while the rubber suspensions of the main driver units, though still performing well, were gradually stiffening up. There wasn’t room here for such bulky items so they got placed up on the terrace under plastic sheets, for use while we were enjoying the sunshine. Unfortunately, this spring was unusually wet and the damp gradually penetrated the chipboard, causing it to swell and break all the joints. So after nearly four decades it was time to say goodbye. I carted the two loudspeakers down to the poubelles and after muttering a few words of tribute left them there. Two hours later they were gone. Time for a brief pang of nostalgia, but at least I never had to throw them into a giant skip. Who knows, I may even hear them again, blasting from the bedroom of some teenager keen enough to rebuild them into their former glory.